Brother ink in Canon MG6150? Discussion in 'Canon InkJet Printers' started by MP640, Oct 8, 2015. Once again, I unclogged the printhead of my MG6150 and flushed the cartridges. I'm considering trying magenta ink from my Brother printers this time. Is it safe to do or would it result in serious trouble? The Brother printer uses a piezoelectric print head, that prints using a mechanical pumping action. This doesn't heat the ink very much. The Canon printer uses a thermal print head that prints by forcing ink through the nozzles by heating the ink and creating steam bubbles. This heats the ink much more. This means that the ink for the thermal print heads must be thermally resistant and not leave deposits on the nozzle heaters. This property is not needed for the ink for the piezoelectric printers. Different values for viscosity and surface tension might also be needed for the two ink types. This makes me think that using ink for Brother printers in a Canon printer is not a good idea. Brother printers have piezoelectric element printheads like epsons. Canon printers have thermal printheads that vaporise the ink into a bubble that then pushes itself out of the nozzle. Because of this, the brother ink may not work well in the Canon printer. EDIT: PeterBJ offered a better explanation. @MP640, the simple answer is DON’T use Brother ink in your Canon printer if you care about your print head, the Brother ink will definitely work but not for long, so please get yourself a new bottle of Canon ink and be done with it.. Here is some magenta ink for Canon printers. If I were you, I would just get some of this stuff rather than risk destroying your printhead. Thank you all for your replies. A little more background information. I do have magenta ink for Canon printers. I run two MG6150s that both have problems printing magenta. From the nozzle checks it looks like it starts with ink flow problems and then suddenly magenta disappears completely. When I investigate it turns out that the magenta on the printhead is completely blocked. Unclogging the printhead solves the problem, but only for a limited period of time. The one thing both printers have in common - apart from the magenta problem - is the ink that I use. I followed the magenta/fungus discussions here and ordered new ink some time ago. No luck so I was prepared to try something else. Anyway, you guys have convinced me it's not a good idea to use Brother ink so I think I will just try again with my magenta for Canon. Flushed cartridges are drying now, so in the next couple of days I'll give it a new try. Canon, Brother, HP, Ricoh etc. 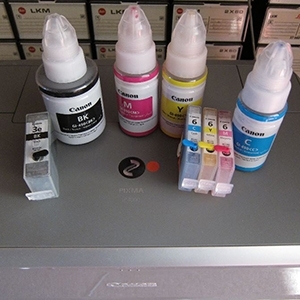 and get some quality German OCP ink for you printer. @MP640, The problem that some guys are having with the 3rd party magenta is two fold, of all the inks the magenta seems to suffer the most from bacterial attack. It’ not the age of the ink that is the problem but it most certainly helps to have ink that’s under two years old after first opening it, contamination is only one easy step away each time you refill. Never put ink from a syringe back into the open bottle and when using SquEasy bottles the same applies don’t draw ink from the cartridge back up the needle, extra, extra hygiene is essential when handling the magenta ink..
One further note, cartridge hygiene is also to be considered in the equation, so if a cart starts to have ink flow issues then don’t wait, change to a different cart and deal with the problem cart later by purging several time if need be..
palombian, Shankar and PeterBJ like this. I'm surprised no one suggested to try the Canon ink in the brother printer... I wouldnt be surprised to see it work since Piezo heads are somewhat forgiving.